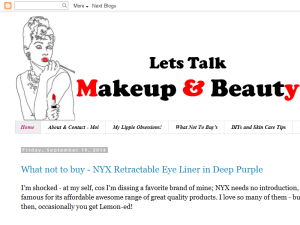 This what your Reviews, Wishes and Fun on makeup and beauty Blog Ad will look like to visitors! Of course you will want to use keywords and ad targeting to get the most out of your ad campaign! So purchase an ad space today before there all gone! Next time you're in Sephora and is planning to check out Ole Henrikson's products, here is something I wish to warn you about - They are not for all skin types. Especially not sensitive skin... Do visit my blog for reviews & giveaways! Cheerz! Indie Brands Series: Silk Naturals Vitamin C Peptide Serum and why you should never buy just a sample of this! The One and The only Facial Oil you'd ever need.. If you are the owner of Reviews, Wishes and Fun on makeup and beauty, or someone who enjoys this blog why not upgrade it to a Featured Listing or Permanent Listing?